At these concerts I also first listened to a symphony of Bruckner. Beyond its "heavenly length" I can remember nothing of it except its conclusion. The finale was cast in the shape of a formidably dull fugue, and as it showed signs of reaching its peroration I thought to myself that seldom or never had I heard any orchestra pile up such a prodigous volume of sound. It was at this precise moment that an army corps of brass instruments, which must have been crouching furtively behind the percussion, arose in their might and weighed in over the top with a chorale, probably intended as an invocation to "Der alte Deutsche Gott." The crash of silence at the sudden cessation of this din was as shattering upon the ears as the blow of a sandbag. Arnold Bax writing of musical life in Dresden in 1906. 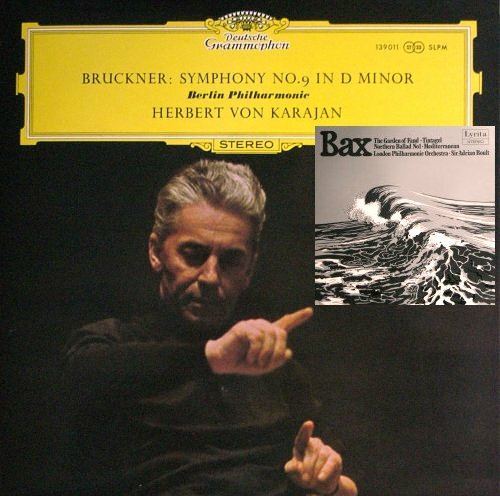 It is surprising that given Mahler's current media profile we are not hearing more Bruckner. And talking of Mahler, the use of the Adagietto from his Fifth Symphony by the great Italian director Luchino Visconti in the 1971 film Death in Venice was the tipping point for the composer's popularity. Could the Epilogue of Bax's Third Symphony be his tipping point? * Quote is from Arnold Bax's long out of print memoir Farewell My Youth. Bax the brazen romantic is here. With thanks to Anna Joubert and John McLaughlin Williams for their Facebook comments. The inset cover is my 1972 Lyrita LP of Sir Adrian Boult conducting Bax. It is superimposed on the original 1966 LP release of Karajan conducting Bruckner's Ninth Symphony. My view on Bruckner or Bax is guided by St. Thérèse of Lisieux who, when she was four, was offered a handful of ribbons to choose from. 'I choose all' she said. Any copyrighted material on these pages is included as "fair use", for the purpose of study, review or critical analysis only, and will be removed at the request of copyright owner(s). Report broken links, missing images and errors to - overgrownpath at hotmail dot co dot uk Also on Facebook and Twitter. A Bax tipping point? Please let it be so!